Take any of our burgers and make it a salad! All the toppings on our burger, but hold the bun and hold the fries. We recommend the Greek Chicken Salad Hilo Bay Garden Salad, Nacho Burger Salad, or the Teri Chicken Salad. 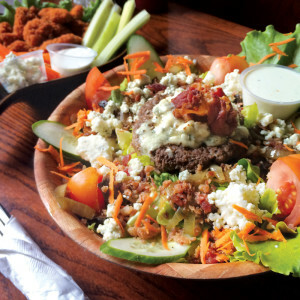 One of our customer favorites is the Blue Cheese Burger Salad made our signature big island grass fed beef patty with bleu cheese, sautéed mushrooms and onions served on a bed of chopped lettuce, tomato, bleu cheese dressing and topped with bacon and more bleu cheese. This dish is a little less indulgent than our full Bleu Cheese Burger and carb and gluten free too! Check out our full menu online and see all our burgers and salads.